Joseph Matthew Blanton...A 1999 graduate of Franklin Simpson High School in Franklin, KY…Attended the University of Kentucky, where he led the Southeastern Conference in strikeouts (133) in 2002, which was also eighth-most among all Division I pitchers that season. Posted a strong 2016 campaign in which he went 7-2 with a 2.48 ERA in a career-high 75 appearances for the Los Angeles Dodgers...He struck out 80 batters in 80.0 IP, the second consecutive season in which he posted 9.0 strikeouts per nine innings...Reached career marks and ranked among National League relievers in ERA (10th, 2.48), opponent batting average (10th, .194) and WHIP (13th, 1.01)...He pitched more than one inning of relief 16 times, recording a 2.28 ERA (7 ER/27.2 IP) in those outings, and threw at least two innings on seven occasions (1.29 ERA)...Was equally strong against right-handed batters (.198 average, 37-for-187) and left-handed batters (.186 average, 18-for-97)... In close and late situations, held hitters to a .168 average (23-for-137)...Started the season strong, posting a 0.87 ERA (1 ER/10.1 IP) in 10 April appearances...Offered scoreless relief in 10 of his final 11 outings (10.1 IP) from Sept. 3-Oct. 2...Earned his first Postseason victory out of the bullpen in Game 4 of the NLDS…Was his first Postseason win since Game 4 of the 2008 World Series. Combined to go 7-2 with two saves and a 2.84 ERA in 36 games (four starts) with the Royals and Pirates…established career-best marks in ERA, winning percentage (.778) and WHIP (1.12). ... Was acquired by the Pirates on July 29 and went 5-0 with a 1.57 ERA (6 ER/34.1 IP) in 21 appearances down the stretch, ranking among the National League's best relievers (min. 15.0 IP) in wins (1st), innings (34.1, 2nd), strikeouts (39, T-3rd) and ERA (9th) during that span. ... Overall, he limited opposing hitters to a .240 batting average, including a .203 mark against right-handers. ... Posted a 1.12 WHIP and a 4.94 strikeout-to-walk ratio (79 SO/16 BB). ... Earned his first save on July 19 with the Royals at Chicago-AL, striking out two in a scoreless inning. ... Opened the season with the Royals' Triple-A Omaha, where he went 3-2 with a 3.89 ERA in seven games (six starts) before having his contract selected on May 16. Completed first season with the Angels with a 2-14 record and a 6.04 ERA (132.2 IP - 89 ER) in 28 games (20 starts)...The 14 losses and 6.04 ERA are both career highs...Became sixth pitcher in Angels history to finish a season with an ERA above 6.00 (min. 100 IP)... Made first 20 appearances of season as a starting pitcher before being moved to the bullpen…In his 20 starts, had a 2-13 record and 5.66 ERA (116 IP - 73 ER)…Led the American League in losses (13), hits (157), earned runs (73) and home runs (24) allowed at time of move to the bullpen... Became third pitcher in Angels history to start a season with an 0-7 record...Club lost each of his first eight starts... Recorded 1,000th career strikeout on May 8th at Houston fanning Jimmy Paredes in the 6th inning... In eight relief appearances, posted an 0-1 record with an 8.64 ERA (16.2 IP - 16 ER)…First three outings were scoreless (6 IP) but surrendered 16 ER in last five appearances (10.2 IP)…First relief appearance came on July 27th at Oakland and marked his first time pitching in relief since April 7, 2012 for Phillies... Did not appear in any of team's final 25 contests…Last appearance of the season came on Sept. 3rd vs. Tampa Bay, marking the longest drought of career without pitching. Went 10-13 with 4.71 ERA in 31 combined games (30 starts) with Phillies and Dodgers...Marked seventh time in eight full MLB seasons he pitched at least 175 innings and fifth time notching at least 10 wins...Established a career high with 166 combined strikeouts...Acquired by Dodgers on Aug. 3 in exchange for player to be named later (Minor League RHP Ryan O'Sullivan)...Ranked second in National League in strikeout-to-walk ratio with 4.88 mark (166 SO/34 BB) and also ranked third in NL by averaging 1.60 walks per nine innings (34 BB/191.0 IP)...Went a combined 8-1 with a 2.37 ERA (22 ER/83.2 IP) in 11 starts when pitching seven or more innings...Had two complete games, tossing a three-hit shutout on May 3 at Atlanta and allowing just one run in nine innings on June 14 at Minnesota. Appeared in just 11 games due to injury, the lowest total for a full season in his career. ... Was placed on the 15-day DL with a medial impingement in his right elbow, 4/29 (retro to 4/24)-5/8. ... Was on the 15-day DL and 60-day DL, 5/16-9/4 (right elbow inflammation); rehabbed with Lakewood (A). ... Went 1-2, 5.17 ERA (22 ER, 38.1 IP) in 8 starts; 0-0, 3.00 ERA (1 ER, 3.0 IP) in 3 relief appearances. ... Allowed just 10 ER combined over his final 6 starts (3.21 ERA). ... Finished season in the bullpen; made 2 spot starts as a member of the bullpen (1 ER, 4.0 IP). Went a combined 9-12, 4.69 ERA in 33 starts for OAKand the Phillies...Posted a 3.60 ERA (66 ER, 165.0 IP) in 27 of his 32 startsand a 10.19 ERA (37 ER, 32.2 IP) in the other five...Pitched at least 6.0 innings in 22 of his 33 starts...Fell 2.1 innings shy of what would have been his third200-inning season...Was OAK's Opening Day starter, 3/25 at the TokyoDome (5.2 IP, 7 H, 3 R, 3 ER, BB, 3 SO)...Pitched at least 5.2 IP in each of his first 15 starts...Traded to the Phillies on 7/17...Earned his 1st win as a Phillie in his 3rd start with theteam, 8/2 at STL (7.0 IP, 4 H, ER)...Snapped a career-long streak of six no-decisions witha win on 9/8 vs FLA...Phillies went 9-4 in his 13 starts...Opponents did not steal a base off him through hisfirst 26 starts of the season (159.0 IP)...Singled in his 1st at-bat as a Phillie on 7/22 at NYM;collected his 1st career RBI, 9/8 vs FLA (sacrifice fly)...Started and earned the win in the Phillies' NLDS Game4 clincher over MIL, 10/5 at Miller Park...Got the win and homered in Game 4 of the WorldSeries, 10/26 vs TB...Became the first Phillies pitcher to ever hit a HR in aWorld Series game; only other to homer in a playoffgame was Hall of Famer Steve Carlton in the 1978NLCS, 10/6 at LAD...Did not issue more than 3 walks in any game and had10 straight starts where he walked one batter or none,6/13-7/30...Had the lowest ERA in June (1.58) in the AL (2nd-lowestin majors)...Pitched a CG, 4/25 vs SEA, but lost 2-0 in 1 hr, 47 min;OAK's quickest game since 8/12/79 at MIN (1 hr, 43 min)...Pitched a 3-hit SHO, 6/2 vs MIN in 1 hr, 49 min,becoming the first OAK pitcher to pitch 2 gamesunder 1:50 since 1975 (Ken Holtzman). Was 14-10 with a 3.95 ERA in 34starts...tied for the American League leadin games started, ranked second in inningspitched (230.0), tied for third in completegames (3) and tied for fifth in shutouts(1)...led the A's pitching staff in inningspitched, complete games and shutouts andtied for the team lead in gamesstarted...had career highs in starts, completegames, innings pitched and strikeouts(140) and his 10 losses were the fewest ofhis three full seasons...issued just 40 walks in 230.0 innings, an average of1.57 walks per nine innings...that mark was fourth lowest in the AL andthird lowest in Oakland history...his .301 opponents on-base percentagewas 10th lowest in the AL...with 140 strikeouts, he had a strikeout to walkratio of 3.50, which was seventh best in the AL and second highest inOakland history to Dan Haren's 3.91 from 2006...yielded 16 home runsfor an average of 0.63 per nine innings, which was fourth lowest in theAL...allowed 240 hits, which was the most in the AL...also tied fourth inmost earned runs allowed (101), was sixth in pitches thrown (3483) andtied for ninth in runs (106)...allowed a .269 opponents batting average,which broke down to .248 (117 for 471) by right-handed hitters and .291(123 for 422) against left-handers...allowed 14 of his 16 home runs toright-handers...10 of his home runs were solo shots...opponents were 4for 7 (.571) with a grand slam with the bases loaded. Allowed a .271 opponentsbatting average the first time through the lineup, .220 the secondtime through and .312 after that...was 7-5 with a 2.69 ERA and .227 opponentsbatting average in 15 starts in Oakland compared to 7-5 with a 5.11ERA and .304 opponents batting average in 19 starts on the road...had thelowest home ERA in the AL and the fourth highest road ERA...is now 22-15 with a 3.55 ERA (126 er in 319.0 ip) in 48 career appearances in Oaklandand 20-19 with a 4.66 ERA (163 er in 314.2 ip) in 54 games on theroad...was 11-6 with a 3.07 ERA in 22 starts on four days rest and 3-4 witha 5.68 ERA in his other 12 starts...his ERA on four days rest was fifth lowest in the AL...is 29-19 with a 3.39ERA (149 er in 395.1 ip) in 61 career startson four days rest and 13-15 with a 5.31ERA (134 er in 227.1 ip) in his other 37starts...was 8-5 with a 3.28 ERA and .239opponents batting average in 19 starts beforethe All-Star Break and 6-5 with a 4.89ERA and .309 opponents batting averagein 15 starts after the break...was ninth inthe AL in ERA at the break...received runsupport of three runs or fewer in 20 of his34 starts and had the ninth lowest run support in the AL with a mark of4.70...was 9-1 when receiving four or more runs of support and is now 32-2 (.941) in his career with run support of four runs or more...in his career,he averages run support of 1.82 in his losses (41 r in 203.0 ip), 4.29 in hisno decisions (62 r in 130.0 ip) and 7.05 in his wins (227 r in 289.2 ip)...was2-0 with a 1.57 ERA in three interleague starts and is now 6-3 with a 2.99ERA (26 er in 78.1 ip) in 12 career starts against the National League...went0 for 4 with three strikeouts at the plate and is now 1 for 9 (.111) with fourstrikeouts and three sacrifice hits in his career...was 3-0 with a 3.08 ERAin four starts against Los Angeles after entering the season with an 0-6record and a 3.77 ERA in his career against the Angels...the A's were 17-17 in his starting assignments and are 53-45 (.541) in his career...tossedseven or more innings in 19 of his 34 starts, allowed two runs or fewer 15times and walked two batters or fewer 30 times...had nine starts without awalk, 14 with just one and never walked more than three...walked onebatter or fewer in 10 consecutive starts from June 13 to July 30, which tiedfor the second longest such streak in Oakland history...went 19 consecutivestarts with two walks or fewer from June 13 to September 15, equalingthe third longest such streak in Oakland history...was 4-3 with a 4.28 ERAin 11 starts at the end of May and then went 3-1 with a 1.58 ERA in sixstarts in June...led the AL and ranked second in the Majors in June ERA...isnow 10-4 with a 2.39 ERA (32 er in 120.1 ip) in 17 career starts in June...thewins and ERA are his best for any month of the season...then went 1-4with a 5.49 ERA in July...that included a four-game losing streak fromJuly 8 to 30 (6.75 ERA)...then went 6-2 with a 4.26 ERA in 11 starts overthe final two months of the season. Tossed a complete game six-hitter onApril 25 against Seattle but lost 2-0 in a 1 hour and 47 minute game...itwas the A's quickest game since August 12, 1979 at Minnesota (1 hour and43 minutes)...it was his first of three complete games in 2007 but it washis third career complete game loss...is now 3-3 despite a 1.04 ERA (6 erin 52.0 ip) in six career complete games...the A's have been shut out in twoof his complete games and scored one run twice...tossed a 1-0, three-hitshutout against Minnesota on June 2 in 1 hour and 49minutes...it was the low-hit complete game of hiscareer and his second game under 1 hour and 50minutes...is the first A's pitcher to have two games under 1:50 in one season since Ken Holtzman in 1975...it was the 26thcomplete game 1-0 shutout in Oakland history but just the second since1991...was involved in two other 1-0 games in 2007, both in June...wasthe losing pitcher in the A's 1-0 loss to Boston on June 7 and had a nodecision in a 1-0 loss at New York (NL) on June 23...the last A's pitcher tobe involved in three 1-0 games in a season was Mike Norris in 1980...hasbeen the starting pitcher in three of the A's four 1-0 losses over the lastthree years...allowed an Oakland record tying six doubles in a 7-3 win at Houston on June 13...tossed a career high 122 pitches in a complete gamefour-hitter on July 3 in a 3-1 win over Toronto...allowed at least 10 hits infour straight starts from July 8 to 25, the longest such streak by an A'spitcher since Rick Langford did it from August 11-28, 1982...began thatstreak by allowing a career high 12 hits in the A's 7-3 loss to Seattle on July8...yielded a career high tying nine runs in 4.0 innings on August 10 atDetroit but ended up with a no decision in the A's 16-10 win...was thewinning pitcher in his 100th career appearance, a 7-3 A's win over Texas onSeptember 15 in Oakland...that extended his winning streak to three games,one of three three-game winning streaks he compiled in 2007. He tied for the team lead and tied for eighth in the American League in wins. He had 12 wins after May 31, which was good for a fourth-place tie with Barry Zito in the AL. After tying an Oakland rookie record with 12 wins in 2005, he posted the fifth-best win total by an Oakland pitcher in his second season (Vida Blue, 24 in 1971; Mark Mulder, 21 in 2001; Zito, 17 in 2001; Hudson, 20 in 2000). His ERA was more than a run higher than his 3.53 ERA from 2005. Blanton allowed opponents to hit .309, which was third highest in the AL. Threw his first shutout on May 31 against the Royals. He allowed 241 hits, which was the fifth most in the AL and the most for an A's pitcher since Dave Stewart in 1991 (245). He yielded 17 homers over 194 1/3 innings, the seventh-lowest percentage in the AL. The 24-year old right-hander spent the entire season in the A's starting rotation and was 12-12 with a 3.53 ERA in 33 starts...set anOakland rookie record for games started, breaking the previous mark of 32 by Matt Keough in 1978, and tied the record for wins set byChris Codiroli in 1983...is the sixth Oakland rookie to win 10 games, the third to toss 200 or more innings (201.1) and the fifth to strikeout 100 or more (116)...his losses were the most by an A's rookie since Codiroli also lost 12 in 1983...his ERA was the best among MajorLeague rookies with 100 or more innings pitched and he was the only rookie with two complete games...finished second among American League rookies in games started and innings pitched, tied for second in wins and was fourth in strikeouts...led the A's and ranked 10th among all AL pitchers in ERA...his .236 opponents batting average was fourth lowest in the AL...also tied for third in the AL in balks (2), tied for eighth in games started and tied for 10th in complete games...his 3.55 ERA was the lowest by an A's pitcher who did not finish the season with a winning record since 1978 when Keough went 8-15 with a 3.24 ERA and Rick Langford went 7-13 witha 3.43 ERA...had run support of 3.93 which ranked sixth lowest in the AL...it was the lowest figure by an A's pitcher since Lary Sorensenhad a mark of 3.78 in 1984...received run support of two runs or less in 19 of his 33 starts and he was the starting pitcher in six of the12 games in which the A's were shutout...the A's scored a total of six runs while he was pitching in his 12 losses (71.1 ip, 0.76 per nineinnings), 20 runs in his nine no decisions (49.0 ip, 3.67 per nine innings) and 62 runs in his 12 wins (81.0 ip, 6.89 per nine innings)...was12-1 in 19 starts when the A's scored more than one run while he was pitching and he received zero run support in eight of his losses...was one of the best pitchers in the AL after the first two months of the season...was 0-5 with a 6.66 ERA and .292 opponents battingaverage in 10 starts at the end of May but then went 12-7 with a 2.53 ERA (43 er in 152.2 ip) and .216 (121 for 559) opponents battingaverage in 23 starts from June 1 until the end of the season...his ERA was second best in the AL over that span (Santana, MIN2.48)...was 11-6 with a 2.81 ERA (45 er in 144.1 ip) in 23 starts when pitching on four days rest and 1-6 with a 5.37 ERA (34 in 57.0 ip)in his other 10 starts...had a 3.52 ERA at night which was ninth lowest in the AL...his .236 opponents batting average broke down to.228 (92 for 404) with eight home runs against left-handed hitters and .246 (86 for 350) with 15home runs against right-handers...allowed a .208 (41 for 197) opponents batting average with10 walks (.246 on-base percentage) when leading off an inning...the on-base percentage wassecond lowest in the AL and the batting average was third lowest...opponents hit .223 (33 for148) with runners in scoring position which was sixth lowest in the AL...that mark included a .194(14 for 72) average with RISP and two outs...was 5-7 with a 4.44 ERA (49 er in 99.1 ip) in 17starts at the All-Star Break and then went 7-5 with a 2.65 ERA (30 er in 102.0 ip) in 16 starts after the break...had the fourth lowest ERA in the AL after the break...opponents hit .252 (66 for 262) the first time through the line-up and .228 (112 for 492) after that...went 3-1 with a 2.43 ERA (9 er in 33.1 ip) in five interleague starts...went 1 for 3 (.333) at the plate and recorded his first Major League hit on June 9 at Washington with a third inning single off Livan Hernandez...the A's were 18-15 (.545) in his starting assignments...tossed seven or more innings in 12 of his 33 starts but was just 6-5 despite a 1.61 ERA (16 er in 89.2 ip) in those starts...allowed two runs or fewer 19 times and walked two batters or fewer 21 times... tossed his first career complete game in his fourth career start on April 24 but was the losing pitcher in the A's 1-0 loss at Los Angeles...became the first A's pitcher since Ariel Prieto in 1995 to record his first career complete game before his firstwin...his other complete game was also a loss at Los Angeles, a 2-1 decision on August 31 when he struck out a career high 10...did not strike out a batter over three consecutive starts from May 14 to 25 which was the longest such streak by an A's pitcher since Moose Haas also went three straight starts from May 10-22, 1987...tossed fewer than five innings in four consecutive starts from May 14 to 30, the first A's pitcher to do that without missing his turn in the rotation since Ron Darling did it in his first four starts of 1995...retired just one batter in the A's 14-6 loss at Tampa Bay on May 25, marking the shortest non-injury outing by an A's starter since Blake Stein faced eight batters without recording an out on August 31, 1998 at Cleveland...finished the month of May with a 13.25 ERA and .378 opponentsbatting average in five starts...based on a minimum of 18.0 innings, that was the highest one-month ERA in Oakland history, topping Curt Young's 10.31 in April, 1985, and the fourth highest in the Majors since 1969...started the season by going 0-5 over his first 10 starts to become the first A's pitcher to begin his career with 10 or more consecutive starts without recording a win since Brad Rigby went 0-5 over the first 11 starts of his career from June 28-August 29, 1997...the five-game losing streak was a career high...recorded his first Major League win on June 4 in a 5-2 A's win over Toronto...after a loss on June 9 at Washington, he put together a career best four-game winning streak from June 14 to 29...finished June with a 5-1 record, a 2.06 ERA and a .174 opponents batting average in sixstarts...was named AL Rookie of the Month as he tied with teammate Dan Haren for the AL lead in wins and finished third in ERA...was also named Rookie of the Month in August when he went 3-1 with a 1.17 ERA and .207 opponents batting average in seven starts...led the AL in ERA in August and posted the fourth best one month ERA in Oakland history based on a minimum of 40 innings pitched...his seven starts were the most by an A's pitcher in one month since August of 1992 when Kelly Downs also made seven starts...did not allow a run in consecutive starts on August 21 against Kansas City and August 26 at Baltimore as part of a career best 18.0 inning scoreless streak from August 16 to 31...allowed two runs or fewer and tossed six or more innings in nine consecutive starts from July 26 to September 5...that was the longest such streak by any ML rookie in the live-ball era (1920 to date) according to the Elias Sports Bureau...italso tied the Oakland record for consecutive starts with two runs or less in one season...shares the mark with Jim Nash (April 30 to June 13, 1968) and Mike Moore (June 26 to August 21,1991)...Dave Stewart had 10 straight starts allowing two runs or less from September 18, 1989 to May 9, 1990...Blanton was 3-3 despite a 1.37 ERA and .209 opponents batting average over thenine starts...then went 4-1 with a 3.62 ERA over his final five starts. Spent the entire regular season and postseason at Triple-A Sacramento before he wasselected by Oakland on September 18 after the River Cats won the Pacific Coast LeagueChampionship...had no decisions, a 5.63 ERA and a .214 opponents batting average in threerelief appearances with Oakland...made his Major League debut in just his third professional seasonon September 21 at Texas and retired the side in order in the eighth inning...also pitched inrelief of Mark Mulder on September 26 at Anaheim (3.1 ip, 2 h, 1 r, 1 er, 3 so) and October 1against Anaheim (3.2 ip, 4 h, 4 r, 4 er, 2 bb, 2 so, 1 hr)...was one of four A's first round picks in the2002 draft and became the second A's player from that draft to reach the majors, joining NickSwisher...had pitched in just 27 games at Single-A and seven games at Double-A before makinghis Triple-A debut in 2004...was 11-8 with a 4.19 ERA in 28 appearances, 26 starts, withSacramento...ranked second in the PCL in innings pitched (176.1) and strikeouts (143) and tied forfourth in wins...ranked fourth in the A's farm system in strikeouts...led Sacramento in inningspitched and strikeouts and tied for the team lead in wins...had success early on as he was 3-1 witha 2.22 ERA over his first seven starting assignments...then went 4-6 with a 5.84 ERA in 15 games,13 starts, from May 15 to July 30...finished the year by going 4-1 with a 2.66 ERA over his final sixregular season starts...allowed just 13 home runs for an average of 0.66 per nine innings...walkedjust 34 for a ratio of 4.21 strikeouts to every walk...allowed a .284 opponents batting averagewhich broke down to .294 (87 for 296) against left-handers and .277 (112 for 404) against righthanders...had better numbers on the road as he was 4-4 with a 5.34 ERA and .313 opponents battingaverage in 14 games at Sacramento's Raley Field and 7-4 with a 3.05 ERA and .255 opponentsbatting average in 14 appearances on the road...tossed seven or more innings in 13 of his 28 appearances and allowed three runsor fewer 13 times...did not walk a batter in seven of his assignments and walked just one 12 times...the River Cats were 2-5 in his nodecisions and 13-13 in his starting assignments...did not allow a home run over his first seven starts (44.2 ip) before allowing one in consecutivestarts on May 15 at Iowa and May 21 against Nashville...allowed two home runs over his first 14 starts (89.0 ip) and 11 over hisfinal 14 appearances (87.1 ip)...struck out a season high 11 in a season high 8.0 innings in a win on June 12 at Salt Lake...tossed his onlycomplete game of the season on August 11 at Colorado Springs but he was the losing pitcher in Sacramento's 3-1 loss (9 h, 1 bb, 6so)...struck out 10 in his final start on September 1 at Tacoma, his second game of 10 or more strikeouts...then went 1-0 with a 3.14 ERAin two postseason starts...picked up the win in Game 2 of the PCL semi-finals against Portland on September 9 (7.1 ip, 7 h, 3 r, 1 er, 1bb, 9 so)...had a no decision in Game 2 of the finals on September 15 against Iowa in a game in which the River Cats scored three inthe bottom of the ninth to win 5-4 (7.0 ip, 10 h, 4 r, 4 er, 1 bb, 3 so). Ranked second in all of minor league baseball with a combined 174 strikeouts with Single-A Kane County and Double-A Midland in his second professional season...finished second to John Maine of the Baltimore Orioles organization (185)...combinedfor an 11-8 record and a 2.29 ERA in 28 games, 26 starts, at his two minor league stops...held the opposition to a .210batting average which tied for ninth lowest in minor league baseball and also ranked 14th in ERA...led the A's farm system inERA and strikeouts and tied for fifth in wins...had just 26 walks for a strikeout to walk ratio of 6.69 to 1...allowed seven homeruns in 168.2 innings or 0.37 per nine innings...his opponents batting average broke down to .179 (59 for 329) against righthandersand .245 (72 for 294) against left-handers...opponents hit .211 with runners in scoring position...tossed six or moreinnings in 19 of his 26 starts, did not allow a run 10 times and walked two batters or fewer 23 times...began the season atKane County and was 8-7 with a 2.57 ERA in 21 starts...led the Midwest League in strikeouts (144), ranked second in walksper nine innings (1.29), tied for third in shutouts (2) and seventh in ERA...led the Cougars in strikeouts and ranked second inwins and innings (133.0)...was 2-6 with a 3.42 ERA over his first nine starts and 6-1 with a 2.02 ERA over his final 12starts...was named Midwest League Pitcher of the Week three times at Kane County: April 28 to May 4, June 30 to July 6 andJuly 21 to 27...tossed a one-hit shutout in the second game of a doubleheader on May 2 against Peoria in a 5-0 win...pitchedin the Midwest League All-Star Game on June 17 and retired the side in order in his only inning (1.0 ip, 2 so)...had a five-gamewinning streak from May 29 to July 10 and capped the streak by not allowing a run in his final three starts, June 30 to July10 (22.0 ip)...struck out a career high 14 in his final start with Kane County on July 22 against Daytona, equaling the third beststrikeout total in the minors in 2003...was promoted to Midland on July 27 and was 3-1 with a 1.26 ERA in seven games, fivestarts, with the Rockhounds...allowed a .174 opponents batting average...overall, went 9-2 with a 1.78 ERA over his final 19minor league appearances...his final two outings of the regular season came in relief, including August 24 against Arkansas,when he recorded his first professional save...moved up to Sacramento on September 1 and made one postseason appearancefor the River Cats in relief (1.0 ip, 2 so). Was the A's second of four first round draft picks and signed on July20...was 1-2 with a 4.43 ERA in six games, three starts, at Short-Season Single-A Vancouver and Single-A Modesto...alloweda .244 opponents batting average...allowed just one home run and struck out 21 in 20.1 innings...began his professional careerat Vancouver and was 1-1 with a 3.14 ERA in four games, two starts...tossed a total of 6.1 innings in his first three games,one start, before tossing seven shutout innings (1 h, 5 so) on August 20 against Boise to record his first professionalwin...earned Northwest League Pitcher of the Week honors the week of August 19-25...was promoted to Modesto on August23 and went 0-1 with a 7.50 ERA in two games, one start...made one postseason start with Modesto and took the loss (4.0ip, 3 h, 2 r, 2 er, 2 bb, 6 so). November 2, 2017 RHP Joe Blanton elected free agency. October 13, 2017 Washington Nationals activated RHP Joe Blanton. October 6, 2017 Washington Nationals reassigned RHP Joe Blanton to the minor leagues. June 11, 2017 Washington Nationals activated RHP Joe Blanton from the 10-day disabled list. 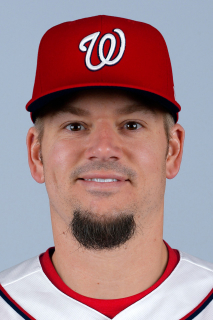 June 8, 2017 Washington Nationals sent RHP Joe Blanton on a rehab assignment to Harrisburg Senators. May 17, 2017 Washington Nationals placed RHP Joe Blanton on the 10-day disabled list. Right shoulder inflammation. March 2, 2017 Washington Nationals signed free agent RHP Joe Blanton. November 3, 2016 RHP Joe Blanton elected free agency. August 12, 2016 Los Angeles Dodgers activated RHP Joe Blanton from the bereavement list. August 8, 2016 Los Angeles Dodgers placed RHP Joe Blanton on the bereavement list. January 19, 2016 Los Angeles Dodgers signed free agent RHP Joe Blanton. November 2, 2015 RHP Joe Blanton elected free agency. July 30, 2015 Pittsburgh Pirates activated RHP Joe Blanton. July 29, 2015 Kansas City Royals traded RHP Joe Blanton to Pittsburgh Pirates for cash. July 28, 2015 Kansas City Royals designated RHP Joe Blanton for assignment. May 16, 2015 Kansas City Royals selected the contract of RHP Joe Blanton from Omaha Storm Chasers. February 13, 2015 Kansas City Royals signed free agent RHP Joe Blanton to a minor league contract and invited him to spring training. February 13, 2015 RHP Joe Blanton assigned to Omaha Storm Chasers. April 15, 2014 Sacramento River Cats released RHP Joe Blanton. March 31, 2014 Oakland Athletics signed free agent RHP Joe Blanton to a minor league contract. March 31, 2014 RHP Joe Blanton assigned to Sacramento River Cats. March 26, 2014 Los Angeles Angels released RHP Joe Blanton. December 12, 2012 Los Angeles Angels signed free agent RHP Joe Blanton. November 3, 2012 RHP Joe Blanton elected free agency. August 3, 2012 Philadelphia Phillies traded RHP Joe Blanton to Los Angeles Dodgers for cash. September 5, 2011 Joe Blanton roster status changed by Philadelphia Phillies. September 2, 2011 sent RHP Joe Blanton on a rehab assignment to Lakewood BlueClaws. August 17, 2011 Philadelphia Phillies transferred RHP Joe Blanton from the 15-day disabled list to the 60-day disabled list. May 9, 2011 Philadelphia Phillies activated RHP Joe Blanton from the 15-day disabled list. April 29, 2011 Philadelphia Phillies placed RHP Joe Blanton on the 15-day disabled list retroactive to April 24, 2011. Impingement in his right elbow. May 3, 2010 Philadelphia Phillies activated RHP Joe Blanton from the 15-day disabled list. April 23, 2010 Lakewood BlueClaws sent RHP Joe Blanton on a rehab assignment to Reading Phillies. April 20, 2010 Joe Blanton assigned to Lakewood BlueClaws. April 3, 2010 Philadelphia Phillies placed RHP Joe Blanton on the 15-day disabled list retroactive to March 26, 2010. Left oblique strain.